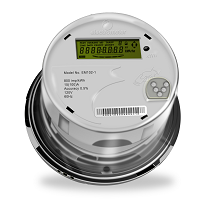 The EM102-5 is a single phase two wire type S electronic meter equipped with the latest Radio Frequency (RF) communication technology. It allows consumers to better manage their budget by providing credit level indicators. The EM102-5 benefits from the RF technology which allows a two-way communication path between the utility company and the consumer. Various forms of information and data can be transferred securely via the RF communication including but not limited to customer data, meter configuration and monthly consumption.